DENVER, January 1, 2017— As part of a transition plan announced in 2016, Katie Kramer has assumed the role of chief executive officer of the Boettcher Foundation. Tim Schultz will retain the title of president until his retirement in July of 2017. 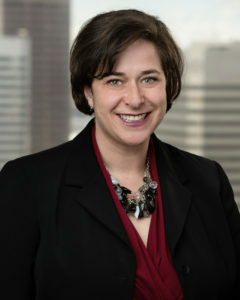 A Colorado native and Boettcher Scholar, Katie Kramer has spent almost 20 years in multiple roles at the Boettcher Foundation, including 15 years as vice president and assistant executive director. She has led nearly all of the foundation’s programming areas and played a key role both in directing the foundation’s day-to-day operations and establishing its long-term strategic vision. “I am very excited to guide the foundation as we build upon the legacy and impact that the Boettcher family had on Colorado,” said Katie Kramer. Kramer attended the University of Colorado Boulder, where she was a Presidents Leadership Scholar and honors graduate at the Leeds School of Business. In 2009, she completed her Executive MBA at the University of Denver’s Daniels College of Business. Kramer was named one of the 25 Most Powerful Women by the Colorado Women’s Chamber of Commerce in 2016. She was also recognized as one of The Denver Business Journal’s “40 Under 40” in 2014. She has served as the board chair for the National Scholarship Providers Association and the Denver Metro Chamber Leadership Foundation.